As you might have read on the Official Google Blog today, Google is launching Google Services for Websites, a new program that lets partners offer Google services — including Custom Search, Site Search, Webmaster Tools, and AdSense — to their users. Partners, such as hosting providers and blogging platforms, can integrate these services into their own management consoles, making the services easily accessible to their users. Google Services for Websites allows partners to create Google accounts, submit Sitemaps to Webmaster Tools, configure Custom Search, and provision new AdSense accounts on behalf of customers. Additionally, partners are eligible for referral fees for certain services. Once Google Services for Websites has been integrated into the control panel, users can configure their Google services in minutes. These services can help increase website traffic, provide site search, and monetize website content. 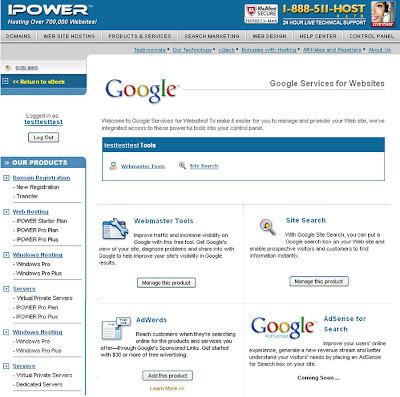 In fact, a number of web hosting providers have already integrated these services into their offerings. Furthermore, all of these services are designed to complement and enhance one another. For example, Sitemaps submitted to Webmaster Tools not only improve the discoverability of websites on Google search, but also improve coverage and freshness in the Custom Search index. AdSense accounts can also be associated with search, which lets website owners earn revenues from relevant ads displayed alongside search results. To learn more about integrating Google Services for Websites with your services, read the Google Services for Websites program overview.